While the new Volkswagen Taigun Concept is expected to make a debut on the Chinese market in 2016, an incredibly resembling car should be brought to market by Jiangsu Lake Motors, a local auto maker. By incredibly resembling, we mean it looks like Volkswagen Taigun Concept in 99%. We are talking about the same style, the same alloy design – long story short, take a look at the two cars brought face to face and the common features shall strike you. 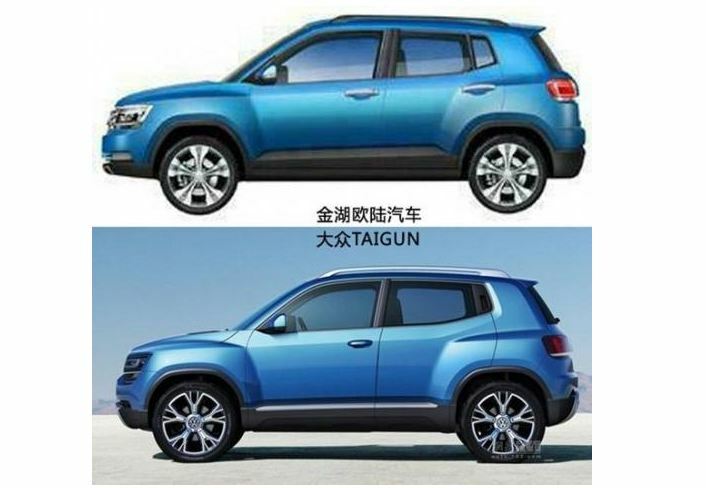 So far, the German car maker made no statement regarding the copy of its Volkswagen Taigun Concept, while Jiangsu Lake Motors defended its cause by claiming that imitating the unit is an expression of their purest admiration and a sincere form of flattery. Given the fact that the real fake of Volkswagen Taigun Concept is not intended to leave the boarders of China, there is actually little that Volkswagen can do or achieve, even if it decides to act the plagiarist in court. Unfortunately, this is not the only circumstance when a nearly anonymous Chinese car maker copies the concept of a popular brand and perhaps more stricter rules should be applied, in order to prevent such experiences in the future.